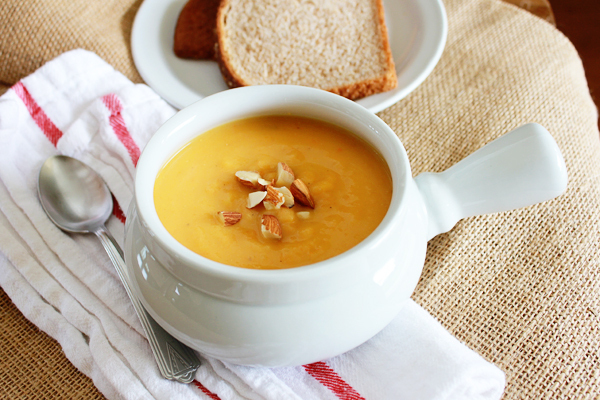 A smooth, hearty blend of butternut squash, carrot, celery and apple combine to create this Fall favorite Butternut Squash Soup. I love that once it cools down, even just a bit (and by that I mean some days start out in the high 70s and only get up to the mid 80s) that I can convince my husband that soup is what’s for dinner! I have always loved soup, especially when it is cold out side. Soup served with bread or a grilled cheese sandwich just completes me sometimes. Years ago when my husband and I first started dating, he used to pretend that he ate dinner at my house; which really meant eating something relatively well-rounded and healthy with me about 7:30/8pm and then stopping by Checker’s for a Diet Coke and fries on his way home. One of the most surprising meals that he admitted to liking was butternut squash soup, I don’t know if he was just trying to impress me or what? but these days he really does like it! This soup is a quick and easy meal that will make any week night feel just a little more special. A smooth, hearty blend of butternut squash, carrot, celery and apple even the smallest member of your family will enjoy – I know mine sure did! In a large pot add the stock, apple, carrot, celery and potatoes, bring to a boil over medium heat and simmer until softened, about 15-20 minutes. Add the squash puree and simmer over low an additional 5 minutes. Remove from the heat and cool for 10 minutes. Using an immersion blender or using a standard blender (working in small batches) puree the soup until smooth, serve warm. Me too, don’t you just love the thick texture of pureed soups, thanks for stopping by! It’s soooooo soup season and I’m pumped! Never made a butternut squash one! I’ll have to try this – I’ve pinned it for later! Sounds yummy! I love butternut squash soup but have never added apple to it. Can’t wait to try it! Some may call me lazy, but I prefer to think of myself as a time-saver 🙂 So, why not boil/cook the butternut squash with the other items, instead of cooking and pureeing it separately? I guess the trade-off is the time it takes to peel and chop raw squash, vs. baking it whole and then scooping out the flesh. Personally I like the flavors to meld in the pot, so I’ll probably stick with my current method of peeling/chopping/cooking the raw squash with the other items. To each her own 🙂 But definitely one could forego pureeing the cooked squash before adding it to the pot, since it’s all going to be pureed later anyway. Just throw it in the pot, give it a quick stir, and save yourself a step!